Even an adult dog can sleep for 12 – 14 hours a day. You may allow your dog to get a good night’s sleep in your bed, which is fine but keep in mind that sleeping with your precious pooch may worsen allergies and asthma, create sleep disturbances, facilitate the transmission of parasites, and simply make it hard to keep your sleeping space clean. You also never want your bed to be something your pooch becomes possessive over. It’s nice for a dog to have a space of his own as well. There are a variety of dog bed types and styles available to you and this is the article which profiles the best orthopedic dog beds for your pooch. OK, so now you might be wondering, don’t only old or sickly dogs need an orthopedic bed? In fact, most dogs can benefit from an orthopedic bed, regardless of physical fitness or age. So, what does that mean exactly? Well, let’s take a look! How Will My Pooch Benefit from an Orthopedic Bed? An orthopedic dog bed is a bed for your large breed . It is a bed that separates your precious pooch from the floor using thick, dense foam as opposed to just regular stuffing like a regular dog bed. Not only does this help protect your dog from friction from the floor, it also offers much more protection against cold than a simple mat or regular dog bed. As your dog ages, cold can really set off or escalate arthritis. Additionally, an orthopedic dog bed won’t flatten out overnight like a regular bed is likely to. Because they are made of high-quality, compact foam an orthopedic dog bed will provide hip and back support all through the night. Choosing a good orthopedic bed for your pet is a matter of putting his best interests first. An orthopedic dog bed will offer support and comfort to ensure that your dog wakes up and feels rested and ready to go. It will also provide support while he ages. Proper back and hip support while your dog dreams means that he is less likely to develop joint issues, as your pup gets older. Additionally, having a bed that offers the same type of support as a person’s bed will mean that your dog won’t have to jump up and down onto a high bed, potentially stressing his joints. An orthopedic dog bed is also thick enough to protect your dog from the cold. Not only will this help keep him warm on chilly nights, but cold and dampness can also set off arthritis and your dog’s orthopedic bed can protect him from these painful episodes. Finally, although more expensive than a traditional dog bed, an orthopedic and indestructible dog bed will be of way higher quality as it will be made of better, more resistant materials. You may actually end up saving money with an orthopedic dog bed, as it will last longer than a dog mat or regular dog bed. As an orthopedic bed for your pup is a little bit of an investment, you want to make sure you pick the right one. Follow these hints and tricks to make sure you pick the right bed for your pooch! Consider your home’s décor. When selecting a dog bed, ensure that you pick a bed that either has a neutral color or matches the color scheme in your home. In short, your dog won’t sleep on a bed that is the wrong size for him. This is especially important for larger breeds. Ensure that the bed is at least 4 inches thick and that you can’t feel the floor when you press down on it. To determine the right length of the bed for your pup, measure your dog from his bum to his nose. Then add about 12 inches (or 30 centimeters) to that length. This is the appropriate size bed for your dog, giving him the option to stretch out if he so pleases. Being able to clean your pup’s bed is a big consideration when it comes to selecting a bed for your pup. Since an orthopedic bed is a bit more of a financial commitment, you will want to be sure that it can stand the test of time. Make sure that the dog bed you purchase has a removable cover. This will make the bed simple to clean if your dog should accidentally soil it. It is also handy in case a dirty or wet dog lays down on it. Finally, should your dog suffer a flea infestation, having a washable cover will save you from simply having to throw out the entire bed. You can also purchase a waterproof covering separately for the bed if you have a dog who’s very prone to accidents and make sure to select a fabric type that does not trap hair, as all pet parents know that hair can be a nightmare to remove, even with washing. Specially calibrated for bigger dogs. Available in Large, XL, Giant XXL. Too powerful for smaller dogs. This orthopedic dog bed is specially designed for large dogs and comes in three sizes: Large, extra large, and giant. It also comes in three attractive and fairly neutral colors. This dog bed is constructed of American-made orthopedic foam and the soft microfiber cover is not only attractive and tear resistant, it is removable and can easily be machine-washed and dried without shrinking. It also features an extra long zipper so you don’t need to struggle to remove and replace the covering for washings. The micro fiber also has a velvet-like feel and will keep your dog warm and comfortable. This dog bed is made out of a whopping 7 inches of high-density foam, is comfortable and will protect your pup’s joints from dysplasia and arthritis. Although expensive, this can end up saving you money in the long run. The bed can also be used with either side facing upwards which can increase the lifespan of the mattress. On top of this, your investment is protected with a 10-year guarantee. Big Barker guarantees that its dog bed won’t flatten out over time and will retain 90% of its original density or you get your money back. This bed is also hypoallergenic, chemical-free, and bacteria-resistant. This means that both your pooch and the non-canine members of you family can sleep easy (pun intended) and safely. The Bottom Line? This orthopedic dog bed is expensive, but with a 10-year guarantee, you can be sure that it will stand the test of time. It is also incredibly thick and boasts a full 7 inches of dense, orthopedic foam that won’t flatten out over time. The comfy cover is machine washable and you can rest assured you have made a safe purchase for your precious pooch as this bed is allergen and toxin-free, as well as resistant to bacteria. This premium dog bed comes in 4 different sizes and boasts 4 inches of dense memory foam for protection of your pets joint, comfort and the ultimate sleep. This dog bed also features walls, so if you have a dog that likes to snuggle or curl up in a corner, you may have found the perfect product for your pet. The bolster can also be used as a pillow! This bed comes in neutral colors and is sure to fit right into your existing home décor. This bed features a non-skid bottom for a sturdy base and the cover is both waterproof to protect the bed against the occasional accident and tear resistant for longevity. The Bottom Line? This dog bed is easy to assemble and, although thin, the cover comes off for an easy machine clean. Although expensive, this bed is durable and a 1-year manufacturer’s warranty protects your investment. 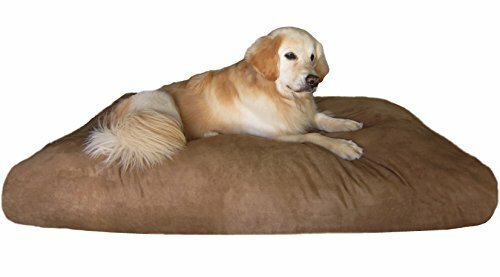 This inexpensive dog bed comes in an XXL size and is stuffed with shredded memory foam, for great comfort and support. This bed provides 6 – 8 inches of dense foam buffer between your pooch and the cold floor, although the chopped pieces of foam provide uneven support. The manufacturer claims that this filling will not flatten over time, guaranteeing you years of use. It also features two easy-to-remove and washable covers. 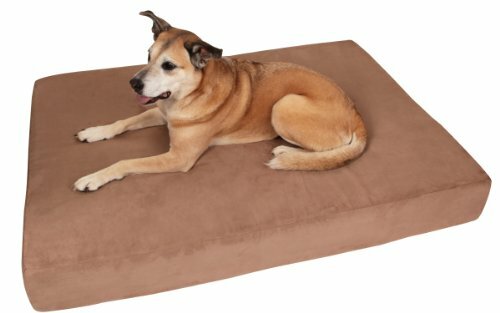 A waterproof internal cover protects the foam from accidents or a wet pup jumping into bed while the external cover is made of soft microsuede and is resistant to wrinkling, bacteria, and stains. Although way less pricey than some of the other beds on this list, this bed is not protected by any warranty; so if this bed gets damaged you may just be out of luck. The Bottom Line? This bed is a great orthopedic option for those on a more limited budget. It is large enough for even giant breeds and boats 5-8 inches of shredded memory foam. The internal cover is waterproof and the external one is in an attractive, neutral color and is easy to clean and dry. Although a steal in terms of price, the manufacturer offers no buyer protection in terms of a warranty. This extra large orthopedic dog bed comes in a lovely neutral gray color. This pet bed is bound to keep your dog slumbering comfortably as it features 7 inches of thick memory foam. It also has a 3-inch thick pillow for pups that like to prop their heads up. Your dog may also use this pillow to support stiff hips. The memory foam is hypoallergenic, so will not set off sneezes in canines or humans! The zippered interior cover is waterproof, protecting your pet’s mattress from accidents. The exterior is made of soft, cozy suede and features an anti-slip bottom. Both are easy to remove and can be washed. The Bottom Line? This thick, memory foam mattress won’t flatten over time and features a nice headrest for your pet. It will protect and support your older dog’s joints and allows any dog to enjoy a deep and peaceful slumber. We wish that a bed this expensive was covered by warranty; however, the waterproof lining will ensure the thick foam is protected. Both covers are easy to wash. This reasonably priced orthopedic sofa bed is perfect for the pup that likes to lounge, but also for dogs that snuggle or feel most comfortable curled up in a corner. This sofa bed has the perfect walls for your pampered pup to cuddle into. The memory foam on this sofa bed is 7 inches thick and won’t pancake out over time. 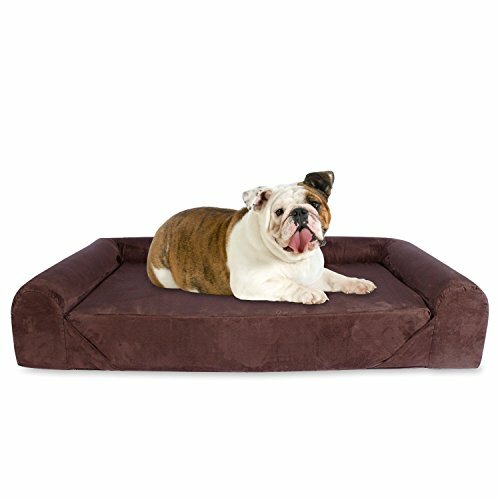 This sofa bed also features double protection: A waterproof internal cover protect the sofa bed’s mattress from damage from wetness and an external cover protects the mattress from dirt and fur and features soft, comfortable suede for your dog to cuddle up on. Both these covers are also easy to remove and clean. The Bottom Line? This bed is large enough for a big breed and features thick memory foam to support tender joints. Your dog is sure to sleep soundly on the seven inches of dense foam and will revel in the fact that he has walls to cuddle into. 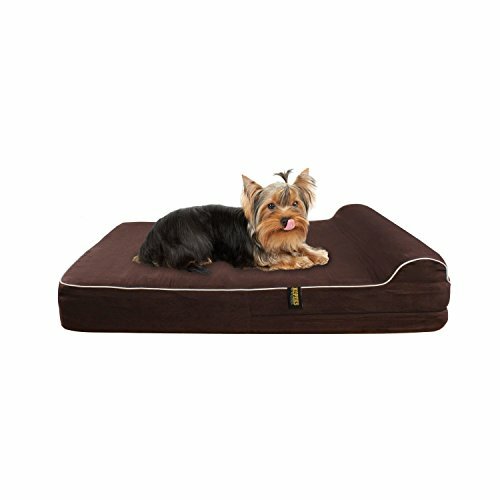 This bed is also safe and won’t slide as your pup climbs up onto it as the soft suede external cover features an anti-slip bottom. Like the waterproof internal cover, this cover is easy to remove and machine washable. Which bed you select for your pet will ultimately come down to your dog’s requirements and preference as well as your budget. Although we love the Big Barker orthopedic dog bed, its price tag may put it out of range for some. The DogBed4Less model is a super comfortable bed for your pet, but if your dog is unstable on his feet or, in fact, requires extra joint support, the shredded foam may not be sturdy enough for him. If your dog like to snuggle in or curl up one of our options with walls or even the bed with a headrest will be ideal for him. No matter which option you select, your pup is sure to enjoy the sweetest dreams on one of these luxury orthopedic beds.